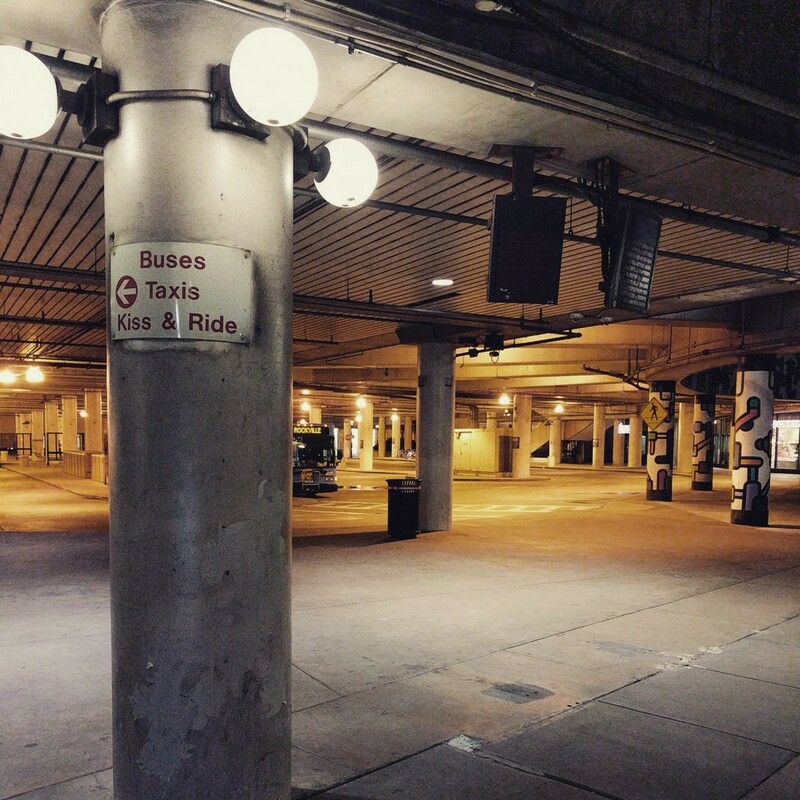 On Tuesday, we featured the 126th challenge to see how well you know the Metro system. Here are the answers. This week, we got 34 guesses. Fourteen got all five right. Great work, Christopher Deal, AlexC, Ginger, Peter K, ArlFfx, JayK, Greg Jordan-Detamore, J-Train-21, Jay, Solomon, maxG, Justin…, CosmoVA, and Kevin M! The first image shows a view of the bus loop at Bethesda. The Ride On bus in the picture should have told you that this was a station in Montgomery County or close to the border. The fact that the bus headsign says Rockville wasn't intentionally deceptive, as that's where this bus goes after it leaves Bethesda. It can't be Rockville since both bus loops at that station are open to the sky. This bus loop is fairly distinctive because it's covered by the Bethesda Metro Center site and plaza. Another clue is the distinctive artwork on the colums to the right. 29 of you knew this one. The next picture shows the pedestrian bridge connecting the two MARC platforms. The bridge is located just south of the Metro platform, and crosses over the station's blockhouse. This is a fairly distinctive structure, and the NOAA buildings in the background should have also helped you come to the correct conclusion. 28 of you got this one right. 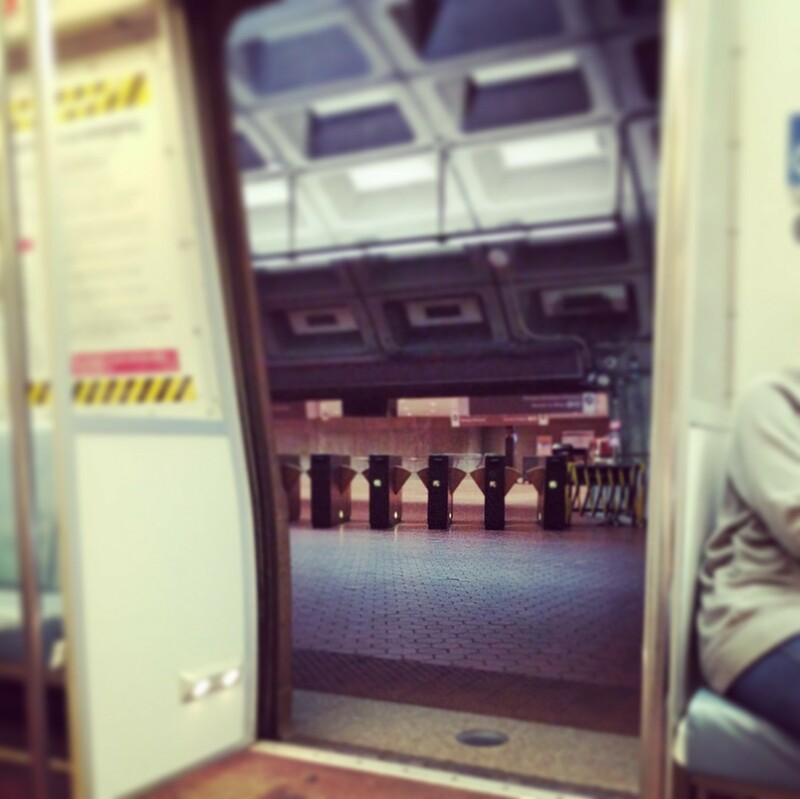 The third image was taken from a northbound train on the upper level of Pentagon station. If you look closely, you can tell that this is a split level station, since the vantage point is clearly from aboard a train and there are no other waffle-style stations with the main fare array on the same level as the trains (a few have a solitary handicap faregate on the platform). That narrows it down to Rosslyn and Pentagon, but it has to be Pentagon because at Rosslyn the fare control is not visible from aboard trains. The main entrance has fare control at street level and the newer east entrance has its own lobby with fare control at train level, but out of view from the platform. 25 of you figured this one out. Image four presented a bit of a trick question. 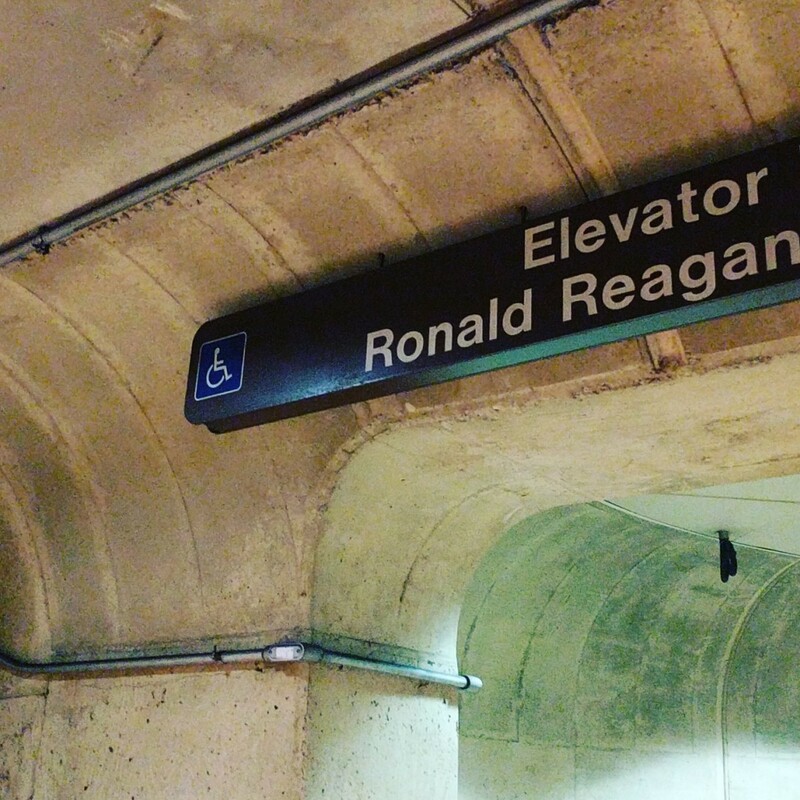 And four of you did guess that this was the station at National Airport (named after the 40th President), but most of you correctly deduced that this sign refers to the Ronald Reagan Building in the Federal Triangle complex. National Airport does have an elevator, but that elevator is in an exterior space below the platform and is enclosed by metal grates, not the concrete walls typical of WMATA's underground stations, like the one pictured. The final image was certainly a trick question, because it's a station that doesn't ever see Yellow Line trains. In fact, on the day I took the picture (this past Sunday), it wasn't actually being served by Yellow Line trains. 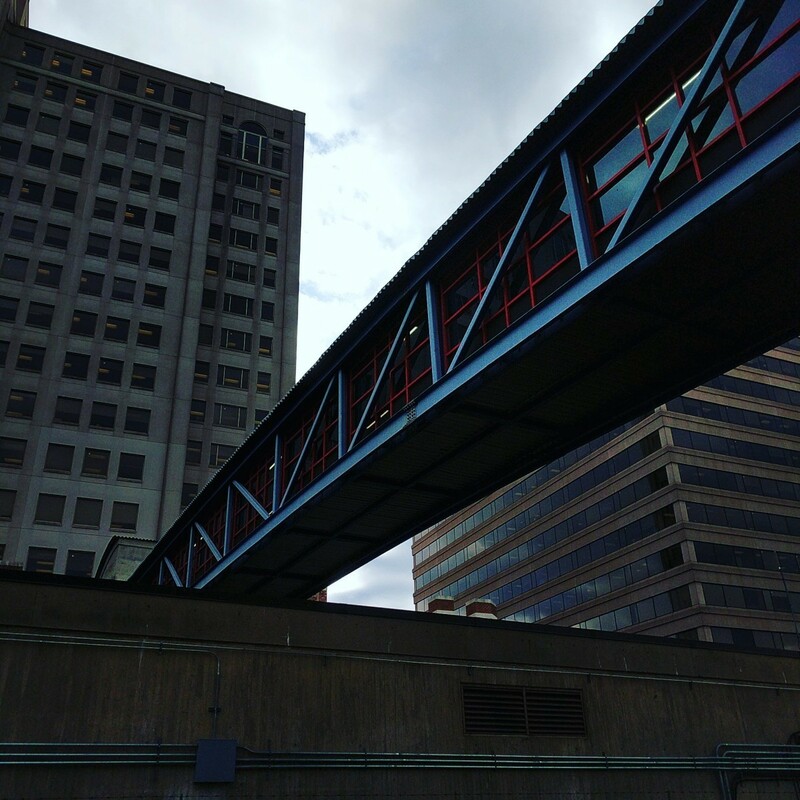 On Sunday morning, Metro had its quarterly emergency response drill at Crystal City, so all Yellow and Blue Line trains coming from the District were being terminated at Pentagon City. Metro's PIDS system apparently can't handle Pentagon City as a Blue Line destination. 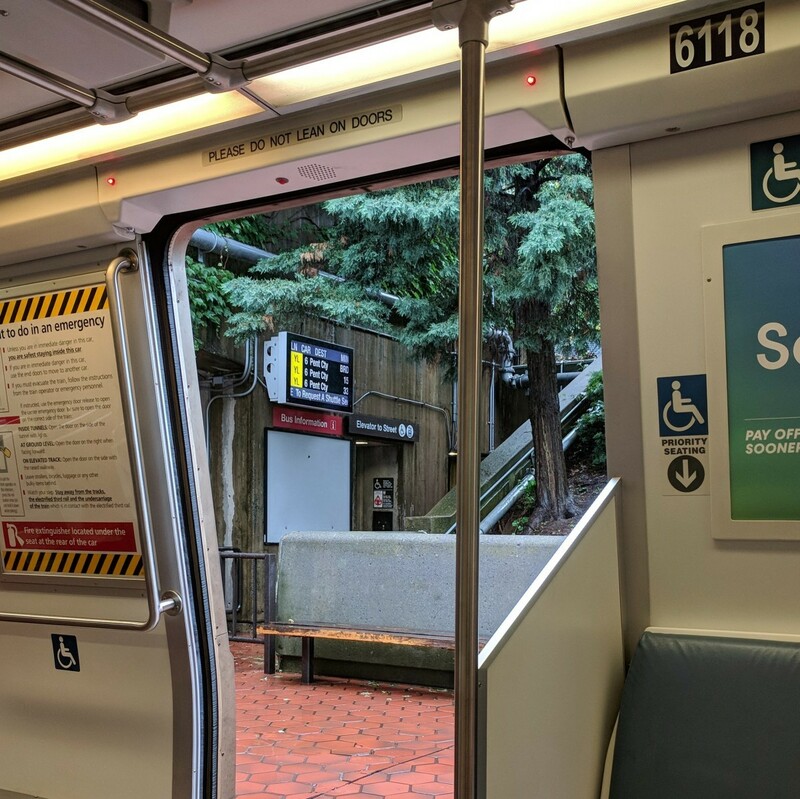 All westbound Blue Line trains were showing on the PIDS and in MetroHero as Yellow Line trains to Pentagon City, though their destination signs called them “special” trains and did not include a line color. However, the train operators did announce them as Blue Line trains to Pentagon City. Despite the sign only showing Yellow, I expected that you would recognize the distinctive and unique setting of Arlington Cemetery station. Clearly, with the vegetation and setting, this has to be a station in an open cut. And since you can't see the other track from this vantage point, this has to be a side platform station. There are only four outdoor side platform stations. Additionally, the colored PIDS signs are only present at stations that have a platform faregate for the elevator separate from the main fare array. None of the other outdoor side platform stations have this setup. Only Arlington Cemetery fits the bill. Luckily, just over half of you saw through the ruse. Great work, everyone. Thanks for playing! We'll be back soon with challenge #127.